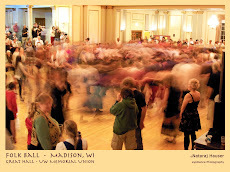 On Tuesday we had Day 149 of peaceful protest against Wisconsin Governor Scott Walker and his thuggish cronies. This particular rally was against recently, and contentiously-elected supreme court justice David Prosser who has been in the news recently, again, this time for allegedly putting a choke hold on a fellow justice. I know, classy, right? The rallies are certainly one way that democracy manifests itself, especially when a significant part of the electorate feels like the administration is exhibiting overreach or bad policy. To answer Walker's supporters, no, democracy does not end at the ballot box. When MillerCoors (a wholly owned subsidiary of South African Brewing corporation) sends in a team to write legislation that is favorable to them and quashes craft brewers you call it "lobbying". 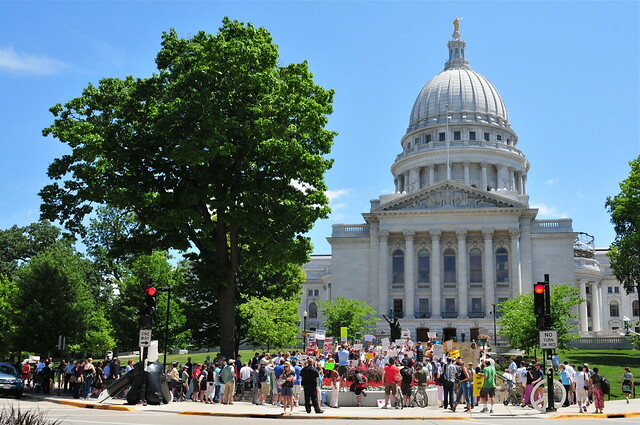 When a thousand, or fifty thousand Wisconsin citizens demonstrate their disapproval of legislation that eviscerates school budgets and middle class jobs, you call it "whining". But as it turns out, on Tuesday we also had elections in seven key districts around the state. Here in Madison, the 48th Assembly district held a special election to fill the seat vacated by Joe Parisi. 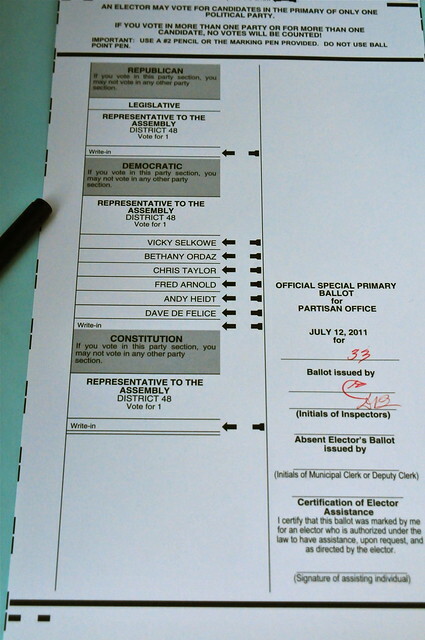 As you can see on the ballot above, there was a field of six Democrats competing for the seat, and not a single Republican. I assure you, no Republican would have won that seat. (Chris Taylor did.) Elsewhere in the state there were six elections where Republicans who sided with Gov. Walker on the legislation that sparked all the protests (adequately covered in previous posts) have been targeted for recall. In a bit of ugly politics, the Republicans fielded "fake" Democrats to muddy the election (boo! hiss!) but truth wins out, and in all six districts the real Democrat candidates won the day. Final elections will be held in a month, and if the Democrat candidates carry the elections the balance of power shifts. Currently the Republicans control all three branches of the state government which has allowed them unfettered power. A tilt in the Senate will at least slow them down. It will also send a strong message that no, Governor, We The People do not appreciate the direction you took and we will now peacefully fix what we broke. The governor himself is likely to be the target of a recall election as soon as he is eligible (early November). As local pol Mark Pocan said, so far they have not done anything we cannot undo. Right on. This is what democracy looks like. Here is a SLIDE SHOW with photos going back 149 days to the start of the protests. The most recent images are up front.